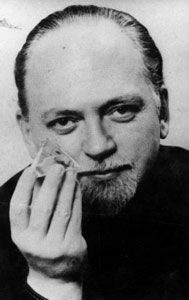 Many readers of this blog are fans, admirers, or friends of Robert Anton Wilson. His unique combination of iconoclasm and humorous, compassionate optimism influenced me profoundly my whole adult life. If you are a Discordian, SubGenius, or a Thelemite, you likely praise Bob. Meeting him was one of the joys of my life, and i'll always regret that he and my late husband never met. For some months deteriorating health has prevented Bob from presenting the talks and online courses which provided him urgently needed income. Now it seems likely that the post-polio syndrome he has suffered for many years is ending his life. Currently he is at home being cared for by family, friends, and hospice. For more information on Wilson's condition and needs, see Mark Frauenfelder and Douglas Rushkoff's Boing Boing post. 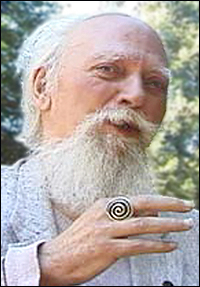 Also, Robert Anton Wilson's Website and the Maybe Logic Academy's Blog have links where you can contribute according to your will and ability. Here's hoping the small and large gifts provide Bob with a bit of comfort and awareness of how much he is loved. Hey, just wondering - what is the standard initiation into Thelema like? Are you allowed to talk about it or is it completely secret? What kind of work do you have to do for it? Does it require preparation like Bar/Batmitsvahs do in Judaism? Well, there isn't really a standard initiation into Thelema, any more than there is a standard initiation into Buddhism or Objectivism. It's really more of a worldview and philosophy than a monolithic religion or single occult organization with universal rituals. There are several groups, orders and organizations promoting Thelema (the O.T.O and the A.'.A.'. being the most famous, both existing in various flavors) using some or all of Crowley's spiritual practices. To further explore some Thelemic variants, i suggest the Aleister Crowley Foundation link in the sidebar, or just looking up Thelema in Wikipedia and following a few links.